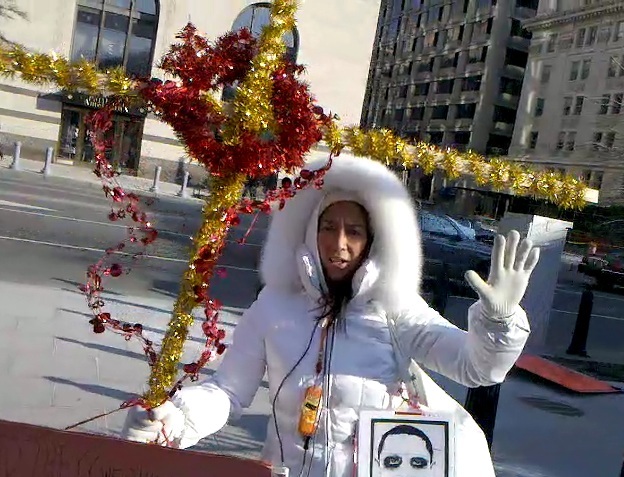 The woman who interrupted the reading of the US Constitution on the floor of the House of Representatives Thursday to shout “birther” protestations has now been identified, by Capitol Police, as Theresa Cao, a colorful DC resident who often haunts the sidewalks of Pennsylvania ave outside the White House. As it turns out, I knew her when. Almost exactly a year ago, I ran into TC, and videotaped a brief interview that I never ended up using. Here, for the first time, is that interview, and the story of our encounter. It was a frigid, windy day last January, and I was hustling out of the White House, over to the offices of Hearst Newspapers to interview Helen Thomas. As I approached the corner of Pennsylvania and 15th, I saw TC with her signs, array of tinsel accessories, and gleaming Hoth-ready attire. I was in a tremendous hurry, but since there had been no briefing that day, I was also on the lookout for any interesting content I could get. As I got closer to her, trying to decide if I should pause to talk to her, the pair of angel wings on the bench next to her closed the deal for me. It was also the first time I had used the video camera on my new Droid, which is why you’ll see some thumb action in there. At the time, I really wished I could have devoted more time to her, because it became quickly apparent to me that TC’s politics weren’t the story, she was. As she rattled off a laundry list of conspiracy theory touchstones, mixed with some fringe-y evangelical patter (the power behind it all, I learned, was Satan. Not the Satan we all know, but Sah-TAHN, which sounds like the same dude, but wearing a douche-y beret at a cocktail party), I found myself wanting to know what made her tick, what made her stand on this street corner in freezing temperatures, proselytizing for WorldNetDaily. Instead, I spent five minutes trying to penetrate that patter, checking my watch all the time, and wishing I had a tauntaun to take me over to Hearst. After we wrapped up, I made a mental note to come back if I had time, but my interview with Helen ran dangerously close to rush hour, and I had to hightail it out of town. I didn’t see TC again until I saw her picture on Countdown last night. I never used the video because it just wasn’t newsworthy, and it didn’t reveal enough of TC to do her story justice, from a human perspective. That, and I wasn’t exactly sure how to get the video off of my phone.